I walk a lot in San Francisco. I walk much of the way to work and most of the way from work, from The Richmond to SOMA and back again. I'll jump on MUNI part of each way, but 3 to 5 miles of it will be just me walking the streets of San Francisco. Walking the city, I feel more in touch with its textures, its curves, its caresses, than I would feel in a car. I wind through each block, letting the stoplights guide my trajectory. Heading west, a light might send me north earlier than planned. Or I might turn to see a street I've never taken, curious what hidden visual treasures that way might reveal. The sights along the way of the distinct architecture of the city propel me along. From the Victorians to the Edwardians, to the stucco-ed houses of the Sunset, these are the structures that give San Francisco its character. I never tire of what I see. I never get bored. Depending on how the day's light, the season's sun, the fog's filter hits these buildings, each day brings new sightings, new adventures in the endless beauty and intrigue of San Francisco. This is very much why I appreciate the work of Paul Madonna and look forward to the San Francisco Public Library's exhibition of his work in the Jewett Gallery of the Main Library branch from May 16th through August 23rd. 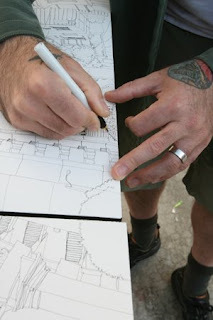 Those who flip through the San Francisco Chronicle will be familiar with Madonna's "All Over Coffee" comic strips and his drawings of house fronts and rooftops. 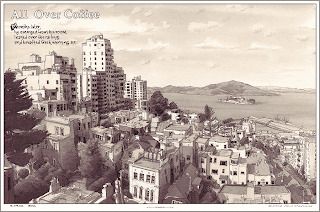 And then there's my favorite piece by Madonna, the one of ubiquitous "San Francisco view", the columnar gap between houses outside many a San Franciscan's apartment window, that acts as the inside front and back cover in the City Lights Books publication of his work. 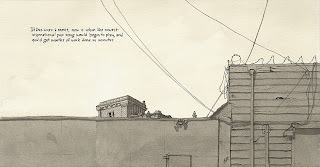 Like his acknowledged predecessors Tony Millionaire and Edward Gorey, Madonna has emphasized architecture in the comic form rather than place it as mere obligatory background. The architectural form becomes the function. Discerning where the picture was inked is part of the fun, but not all the fun. It's wonderful to immediately recognize where his gazing muse has taken him. "That's that coffeehouse at Hayes and Central" or "That's the hill up Noe from the Castro." But it's just as much fun to sit in the muck of not knowing, stuck in your slight uncertainty. You're not able to pinpoint it exactly, but you simply feel as if you've seen the scene Madonna's seen. The drawings are sepia-toned rather than black and white. And when color does appear, it erupts off the page in ways that the tan-ish build-up can only develop. There are words that accompany the drawings. 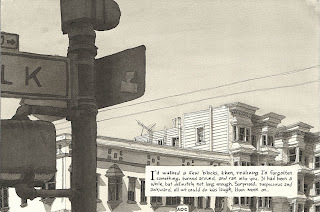 Madonna writes in his book that his words precede the drawings, finding the place after days of scouting for the right spot in the right light to draw these foreground-ed backdrops for his words. (In spite of how some of his passages seem like overheard conversations, Madonna states they are his own fictions, not documented dialogues.) Personally, I'm too taken by the intimately personal the architecture feels to pay attention to the words. They only distract me for now. But that's just me. I know a lot of people appreciate his poetry. I just want to revel in the forms. Madonna is a local artist who has made his mark by marking what all of us who live here see. It's not that Madonna has helped me see my city in a different way, although his wispy fogs have added something to my experience of this peninsula's particular precipitation. It's that he appreciates this city like I do, like many of us do as we make our lives here. Madonna is absorbed in San Francisco's geographic details, its nuances, its idiosyncrasies like his ink is absorbed into his paper. If you're the rare San Franciscan who has avoided his work until now, I urge you to check out the upcoming free exhibition along with the books and DVDs and CDs you might be checking out at the Main Library. Although I appreciate artwork that pushes me, and Madonna's work provides plenty of tip-of-the-tongue, I-know-that-place-but-can't-quite-recall anguish, Madonna is the cherished artist who welcomes you by making you feel at home in his work. His work is all about inclusion rather than exclusion. By merely viewing his work in the very city that inspires it, you are part of the very work itself. Related Program: Artist Talk by Paul Madonna. Book sale and signing to follow. June 25th at 6:00PM. Main Library, Lower Level, Koret Auditorium, 100 Larkin Street (at Grove). Also of related interest: KQED's Spark profile on Madonna and Books Inc.'s video of Madonna speaking on his work. Introductory photograph of Madonna's hands courtesy of Sandra Garcia.